Roehampton House, in Roehampton, SW London, was built by the architect Thomas Archer in 1710-12 for the London merchant Thomas Cary. Cary had been born in the Virginia colony in 1669, where his father John had emigrated six years earlier. Father and son returned to London and by 1690 were running a successful import/export business. The House is a seven bay rectangular structure with three storeys and a basement. The front elevation has a main central bay with the front door approached by a broad double flight of steps with an elaborate wrought iron hand-rail. There is a broken pediment over the door with two Corinthian columns above flanking a large first floor arched window. The bays are divided by orange brick pilasters; the quoins and the pilasters flanking the central three bays are rusticated. The windows have red gauged flat arches with projecting brick keyblocks. The garden (East) elevation is similar although it has a recess instead of a window above the central ground floor opening. In 1791 the house was sold and the sales particulars tell of an elegant principal oak bracket staircase ascending to the first floor,3 groined arches in the basement to give strength and a preventative against fire, stabling for up to eight horses and a double coach house. The house appears to have been occupied by a number of different people after 1791. A Mr Duncan is known to have owned it in the early nineteenth century. In the summer of 1807 it was let by Dr Markham, Archbishop of York. In 1814 it was tenanted by John Pearse, newly-retired Governor of the Bank of England. By the 1840s the family of the Earl of Leven lived there, the last being the widow of Alexander, Lord Balgonie, who died in 1887. 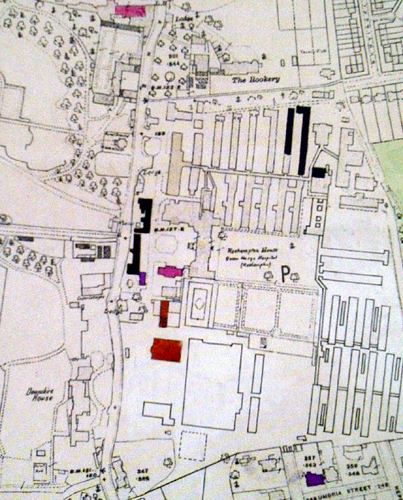 Between 1869 and 1896 the Ordnance Survey maps indicate that there was little change to Roehampton House, aside from a couple of new outbuildings. However, by 1909 the maps show that a small South Wing (set back from the main house) was also added, with an Orangery to the north. In 1910 Mr Arthur Grenfell, a Canadian merchant banker, bought the property and commissioned architect W.J. Parker to work on the house. He asked Parker to design and construct a new South Wing and alterations to the main building. 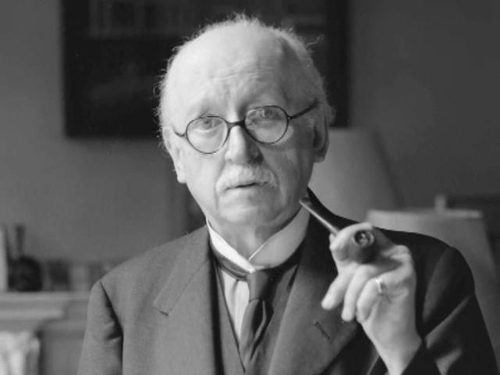 In July 1911 the architect Edwin Lutyens was asked to create a garden and ballroom by Grenfell. Lutyens often worked with the gardener Gertrude Jekyll, but in this instance there is no documentary evidence to suggest that Jekyll was ever commissioned to work on Roehampton House. By 1912 Lutyens had drawn up plans and started work on demolishing and recreating the former North and South Wings and Pavilions and building further structures in the North, as shown on Lutyens plans. Unfortunately Arthur Grenfell was declared bankrupt in 1914 before Lutyens could complete his interior designs. Grenfell sold the property to Kenneth Wilson who let the house and its 30 acres free of charge to the War Office, who on the 28th June 1915 opened the Queen Mary Convalescent Auxiliary Hospital for the rehabilitation of amputees injured in the First World War, with beds for 25 patients. 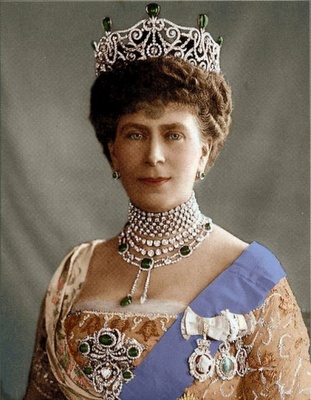 Queen Mary had expressed a wish to become a patron, and the Hospital was named after her. During 1915 the building was made suitable for its use as a hospital, new wards were added, along with fire escapes, huts to create additional wards in the grounds and a limb making factory in the basement. 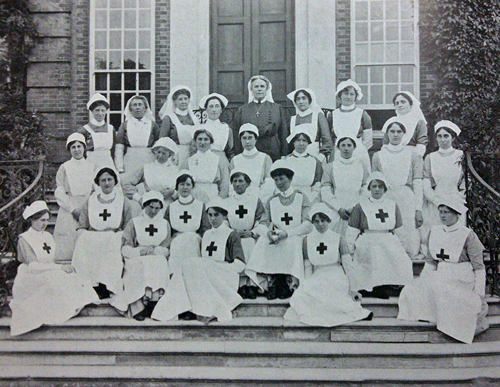 The hospital expanded rapidly between August 1915 and March 1916 and 1189 discharged soldiers were treated there. In 1919 the Governors of the hospital had purchased the building outright for the sum of £58,000, which was the actual cost Kenneth Wilson purchased the property for, including the cost of improvements he had carried out at his own expense. In 1925-26 alterations and additions were taking place and the main body of the house was being used for offices and accommodation. On 6th May 1925 a further extension was opened by Queen Mary. In 1930 the wooden huts that had been erected in the grounds were replaced by brick buildings and the whole hospital was redecorated. Between 1939 and 1945 Ministry of Pensions took sole responsibility for the maintenance and administration and plans were approved for more changes to the hospital, including a new limb fitting centre and factory, wards, kitchens and department for tropical diseases. During World War II bomb damage affected the hospital, after being hit by a high explosive bomb and 55 incendiary bombs in at the end of 1940 and in February 1944. 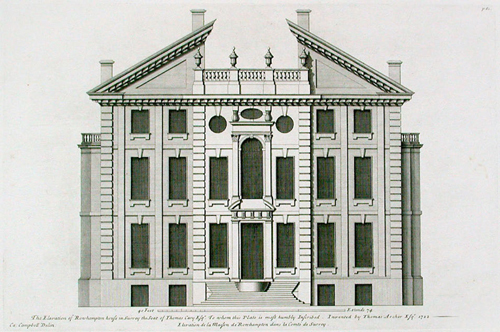 Included amongst more serious damage was the destruction of Thornhill’s Painted Hall in the main house, the need to replace many windows and damage to the South Pavilion and the South-West corner of the South Wing. In 1953 the Ministry of Health assumed responsibility for the hospital when the Ministry of Pensions ceased to exist. In 1957 a new main entrance gate on Roehampton Lane was constructed opposite the main entrance of the house in the West elevation. Several plans were drawn up by London County Council Architects Department and ultimately a design was chosen for two lodges, each with two storeys, flanking curved walls leading to an ornate gate. The gates have the monogram AG, standing for Arthur Grenfell and were moved from where Lutyens had placed them in the North of the estate. The lodges were intended for the Head Gardener and Ministry of Health Resident Engineer. In 1960 the buildings were acquired by Westminster Hospital Group and in 1961 became a NHS (National Health Service) hospital. Alterations continued to the building in the mid 1960s including the opening of casualty, pathology and outpatients departments. By this time the hospital was spread over a large area with many outbuildings, factories and wards in the grounds of the house. In 1967 plans for further expansion saw the construction of a new maternity unit providing 50 beds. In 1978 the hospital was Grade I Listed and by 1982 the main house was used for nurses’ residence. Discovery of asbestos in 1983 brought to light serious structural weaknesses, inadequate fire protection and infestation. In 1985 planning permission was applied for to radically change the interior but the bid was rejected. Major restoration of the buildings at a cost of £700,000 took place. Wandsworth Council gave a £50,000 grant to Richmond, Twickenham and Roehampton Health Authority and restoration included the removal of floorboards, skirting boards and ceilings with the exception of those felt to be of historical interest. The building was in a state of dilapidation after the removal of the timbers and ceilings and specialist conservation work needed to be done to repair such things as fireplaces, mouldings, panels and the staircase. The main house re-opened again on 15th June 1987 by Princess Alexandra, with many modern partition walls added to create new offices spaces and services. The house is currently being refurbished by the award-winning developer St James, part of the Berkeley Group. The development is called Queen Mary’s Place. I have been asked to carry out an analysis of the earlier decorative schemes and to advise on paint and colour. Much of this has been taken from the excellent Building Recording of Roehampton House prepared by Amanda Hayhurst of Pre-Construct Archaeology Limited. August 2011. I am greatly indebted to her for this. Country Life (Lawrence Weaver). ‘Roehampton House’. August 14th 1915. 232-239. Country Life ‘Roehampton House as a Hospital’. August 14th 1915. 239-241. Lees-Milne, James. 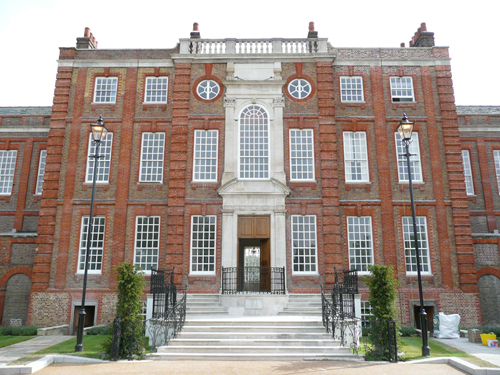 English Country Houses: Baroque, 1685-1715. Country Life. 1970. Miele, Chris. Roehampton House (Queen Mary’s Hospital). An Historical Overview. November 1996. 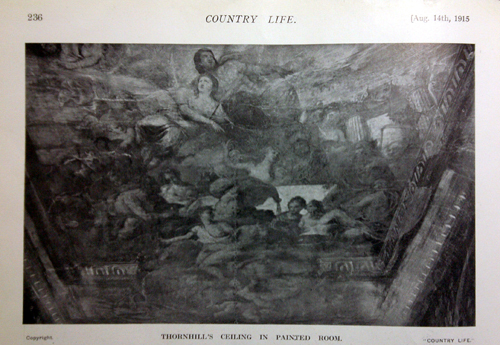 1 Thornhill’s original design is preserved in the British museum’s Prints and Drawings Department. 2 The roof of which was demolished in 1773. It is possible that the pediment at Roehampton was damaged during the Great Storm of 1780 and subsequently removed. The hurricane is described as beginning at nearby Parkstead House and ending at Hammersmith. 3 This has since been moved from its original location.